As summer draws to a very noticeable close in Ireland, I am back again in Rethymnon on the Greek island of Crete. Today’s journey has been a long one, leaving Dublin in the morning for Zurich, catching a second flight an hour later to Iraklion, and then taking a bus from Iraklion to Rethymnon, arriving here late in the evening. But the long journey to Rethymnon is always rewarding. This is my third successive year to stay in Rethymnon, but I have been a constant visitor to this old charming town since the mid-1980s, and have lost count of the number of times I have been back here. This year I am staying for a week in the Hotel Brascos in the centre of Rethymnon, next to the Municipal Gardens and a few steps from the Porto Guora or old gate leading into the old Venetian town, with its labyrinthine network of narrow cobbled streets and squares. 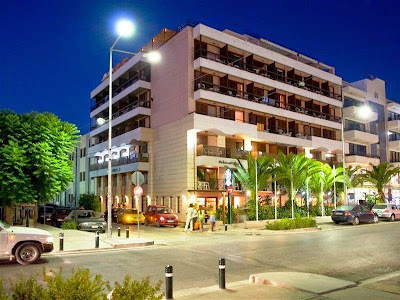 The Hotel Brascos stands on the corner of Moatsou and Daskalaki Streets (Μοάτσου και Δασκαλάκη). This is a friendly hotel with 88 guest rooms, all with balconies, and the roof garden offers panoramic views over the old town with its Turkish minarets, Byzantine towers and Venetian fortezza, and out across to the harbour. The old Venetian port is only 350 metres from the hotel, and the beach – the longest sandy beach on the island – is a mere five-minute walk away. So I am looking forward to walks through the old town, swimming in the sea and in the pool, and watching the sunsets from the hotel roof garden or garden or at a nice tavern I know beneath the walls of the fortezza. Sadly, the annual Renaissance Festival in Rethymnon has been cancelled this year. But there are a number of interesting exhibitions worth visiting this week. Until Thursday next [28 August 2014], the Old Artillery Hall in the Fortezza is hosting “Homage to the Greek,” an art exhibition marking the 400th anniversary of the death of El Greco. The exhibition is open daily from 11.00 to 14.00 and from 18.00 to 22.00. Until the end of the month [31 August 2014], the Kara Mousa Pasa Mosque on Agnostou Square in the Old Town is the venue for “Ghosts of the Mediterranean, or The Reflections of the Past,” a video installation by Marianna Strapatsaki. This exhibition is open daily from 12.00 to 14.00 and 19.00 to 21.00, but is closed on Mondays. There may even be time for trips to some of the monasteries in the hills above Rethymnon, or further afield to Chania or Iraklion.